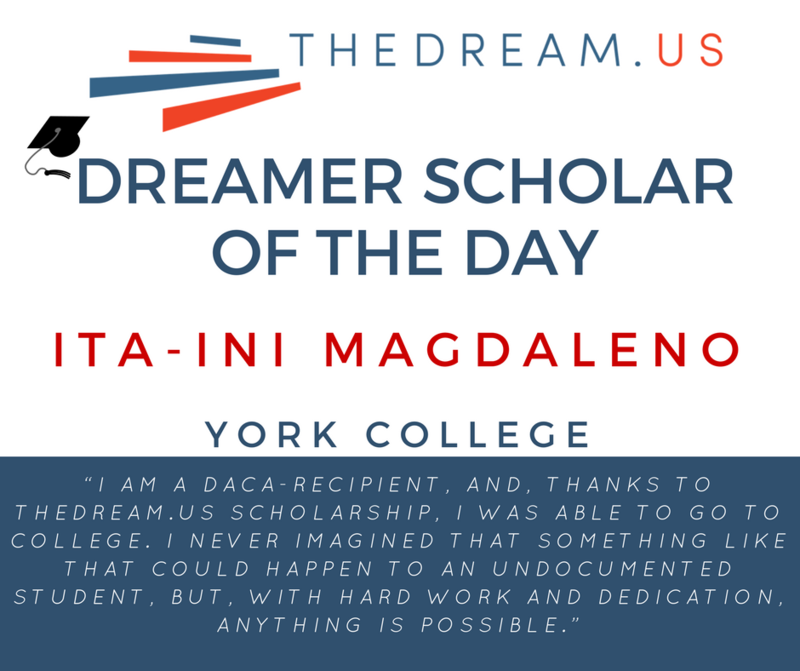 I am a DACA-recipient, and, thanks to TheDream.US Scholarship, I was able to go to college. I never imagined that something like that could happen to an undocumented student, but, with hard work and dedication, anything is possible. The U.S. became my home when I moved here at age three. I grew up learning the history of America and attending school here. During my childhood, I was lucky to live in an environment that was free of hatred and was very supportive. I live in New York – a city full of different cultures – and I grew up in a Latino community where everyone spoke Spanish, which meant that my mother didn’t have to struggle to communicate with people, like some other immigrants do. I have always known I am undocumented. My parents told me as soon as I was able to understand, and even though I haven’t always fully understood what it meant to be undocumented, I learned slowly. At first, I realized I couldn’t travel and was prohibited from many ‘normal’ things. Then, I received DACA when I was 15, and it has changed my life. Through DACA, I am able to go to school, I am able to work, and I am able to file taxes. I am fully part of society.Now, in college, I want to study political science, because I want to make a difference in the immigrant community and help give immigrants a voice. Too many immigrants have to endure hardships and are mistreated, because they feel incapable of defending themselves. Too many are viewed as being less than others because of their nationality. I am lucky to speak both English and Spanish and to be able to defend myself from people who try to bring me down with their words. My sister is one year older than me and she’s in college as well. Both my sister and I know firsthand the importance of college. My mom only finished elementary school, and we want to make her proud. She raised us on her own, and she was extremely proud when I received a full scholarship to college. She raised intelligent daughters who, because of her hard work and dedication, are able to accomplish anything. All three of us push one another to do better and be better.I think that higher education access for DREAMers is important, because we’re no different than documented people. All people have dreams of becoming someone and having success.